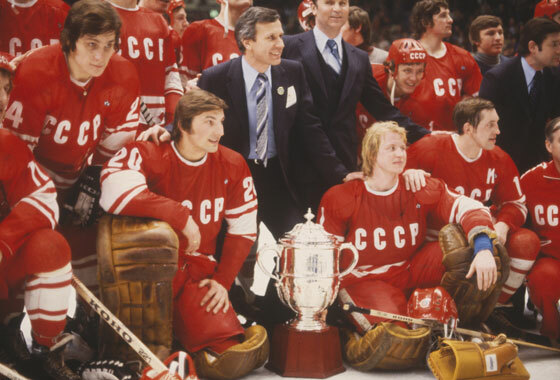 The Soviet Union had the single greatest hockey dynasty of all time. Between 1954 and 1992, they won practically every World Championship, Olympic Title, and Major Cup in existence. Their unmatched exploits include the following: 8 Olympic Gold Medals, 1 Olympic Silver Medal, 1 Olympic Bronze Medal, 1 Canada Cup, 1 Challenge Cup, 1 Summit Series, 15 Izvestia Cups, 21 World Championship Gold Medals, 6 World Championship Silver Medals, and 4 World Championship Bronze Medals. During their incredible dynastic run, the Soviet National Team played 900 games. Incredibly, they were victorious in 745 of them! Yes, that is correct. They won 745 out of 900 games. That translates into a staggering .827 win/loss percentage. And the remainder were not all losses, either. Many of them were ties. The great Soviet Hockey Dynasty was distinctive by two major hallmarks. They were: great offensive firepower and phenomenal goal tending. Simply put, if you were unlucky enough to be their opponent, you could count upon two unmistakable facts. They were as follows: You would never be able to prevent them from scoring and you could never score against them either! The end result was: a slaughter; and absolute slaughter. From 1969 through 1985, Soviet goal tending was recognizable by the presence of one man; a great man. His name was Vladislav Tretiak, and he was the single greatest goal tender who ever lived. This page is dedicated to him.